I quite like the Burt's Bees range of natural products, particularly the ethos behind the brand which started out as a cottage industry selling homemade beeswax lip balms and hand salves at craft fairs. I get the impression that Burt's Bees is a responsible company, with its products presented in recycled or recyclable packaging and a percentage of profits given back to charity and environmental research projects. At its heart are products which are a pleasure to use and I've recently been trialling one of these, Burt's Bees Orange Essence Facial Cleanser. 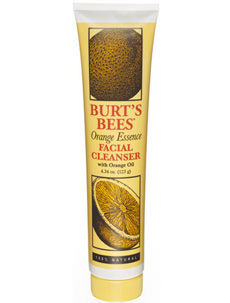 Burt's Bees Orange Essence Facial Cleanser is designed to be used as a sulphate-free facial wash but the rich balm-style formula would also lend itself well to hot cloth cleansing. It feels gentle to use and effectively cleanses without stripping skin. Unsurprisingly, given that I adore the scent of orange, I loved the uplifting scent of Orange Essence Facial Cleanser and it's this which makes it particularly enjoyable to use in the mornings. It also gets another "tick" from me for being presented in a handy tube, although for convenience, I'd have preferred a flip top rather than the screw on lid. I haven't been using Orange Essence Facial Cleanser for long enough to comment on the long-term effects but my first impressions are very favourable. What's more, I feel that this represents fantastic value for money at £10.99 for 123g. A little goes a long way and the price is very reasonable compared with other balm style cleansers.